After a hectic day of raising kids, working full-time, and trying to slap together three edible ingredients to make a family meal, I decided to ride away on a motorcycle. I depleted my saving account and bought a Harley-Davidson Custom Sportster, complete with extra chrome accessories, custom red paint, and fringed, leather saddle bags. I traded my heels for leather boots and felt the need for speed. 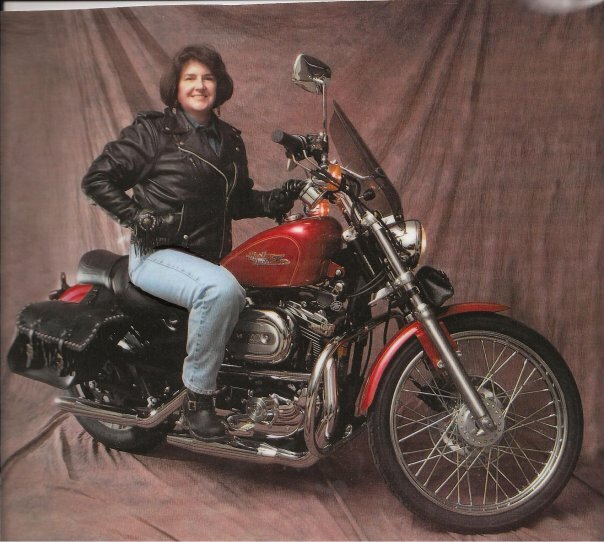 I completed a motorcycle safety course, the only middle-aged woman in a class full of slouching punks, goofy teenage boys, and old hippies. No one flirted with me or even muttered, “Hey, Babe. Let’s take a walk on the wild side.” I must have resembled their grandmother. My first experiences riding my new motorcycle were exhilarating. I covered my head with a brain bucket, put the hammer down, and carved some serious curves while straddled upon 1200 ccs of unleashed power. I channeled my inner Steppenwolf to head out on the highway, looking for adventure, in whatever came my way. This liberated momma was bad to the bone. I made the obligatory trip to the Sturgis Motorcycle Rally in South Dakota. I felt sorry to see so many young women who were too poor to buy clothes. They ambled around wearing itty bitty leather thongs and fishnet tank tops. The poor things could barely walk upright due to the massive bouncing bosoms exploding from their tight leather vests. There was no way those bares butts ever sat more than five minutes on the back of a Harley. They stared at me with glazed eyes and walked away. I ate alone, grateful that I could purchase food. My wild and crazy motorcycle days ended when I almost t-boned a mini-van full of children. I was cruising down a country road feeling free and festive when a frazzled lady on a side road pulled out in front of me. All I could see were those sweet cherubs staring from the window, waiting for me to crash into their little bodies and leave my severed head beside the road. I stomped on my foot brake, grabbed the hand brake, and swerved to the right. The bike stopped, but I didn’t. I careened into the dirt, suddenly appreciating my heavy leather clothing. The lady never noticed and drove on down the road. I hollered some uncharitable language and regrettably took the name of the Lord in vain while gesturing wildly like a possessed demon. These actions were not attractive. The bike weighed more than 500 pounds, and I couldn’t lift it. A group of motorcycle riders came along and stopped to help. They settled the bike upright, checked for damage, and offered to take me home. I gallantly refused any assistance and sent them on their way. I was pleased to see that the women in the group wore clothes. I returned home and parked the bike. A few months later, I sold it to a man who always wanted a Harley. I wished him well and watched as he revved the engine. He waved back and I listened until the guttural noise from the V-twin engine faded in the distance. Returning to the house, I contently counted my cash and my blessings. Love your stories! Please keep writing!